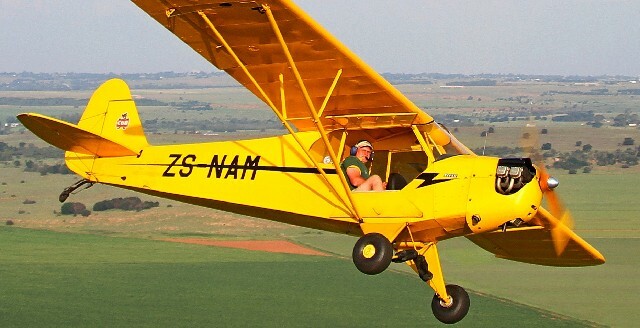 When Coenraad Underhay and Dale de Klerk on 13 April 2015 bought ZS-NAM from Gerald Nagel they became to owners of the oldest certified Cub and the only J-3 powered by the Franklin 4AC-150A 60 Hp (45 kW) engine in South Africa. Dale, the owner of Krugersdorp based Alpi Aviation, started his initial training at Brakpan and went solo at Parys in a Cessna 150 in 1977. In 1972 Dale built a hang glider and later progressed to flying gliders eventually accumulating 1,500 hours on the type. He currently has 4,600 flying hours and is rated on 96 types. In 1995 Dale and Nigel Hopkins started competing in Rallies finishing 10th in the 1996 world championships held in Turkey and winning the title in 2003. Dale has been awarded Springbok colours from 1996 to 2014.Dale is also no stranger to building aircraft having completed a KR2, FP-404, Ibis and Pioneer 200 & 300. Sale also owns two rarities; both his Cvjetkovic and Nieuport 17, built by Coenraad, are the only ones on the SA Register. Coenraad got his wings in 1990 in Secunda were he was not working on the mines and where he earned his electrical engineering diploma. His father built a Benson, one of the first Gyros' in the country and Coenraad followed in his footsteps having built 14 aircraft up to now. He is currently busy with Trevor David's Vans RV7 and has completed, amongst others, a Bushbaby, Zeniths, Slings and the 90% scale Nieuport 17 of World War One fame. Coenraad has also been involved in three restoration projects. A number of different air-cooled engines, most of flat-four configuration, were used to power J-3 Cubs, resulting in differing model designations for each type: the J3C models used the Continental A65 hp 65-8 65 hp (48 kW)- series, the J3F used the Franklin 4AC-150A 60 hp (45 kW) and the J3L used the Lycoming O-145 55 hp (41 kW) . A very few examples, designated J3P, were equipped with Lenape Papoose 3-cylinder 50 hp (38 kW) radial engines. 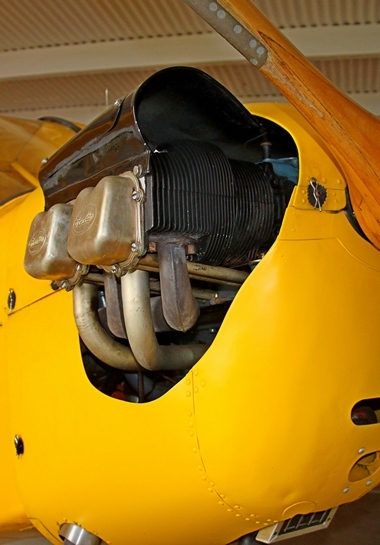 The Franklin 4 was a series of air-cooled aircraft engines of flat-4 configuration produced in the 1930s and 1940s. Besides the Cub, Franklins can be found in a number of early helicopters. It powered the Hiller 360, Sikorsky S-52 and the legendary Bell 47 as well as the Taylorcraft 15, Stinson Voyager and Bellanca Cruisair fixed wings amongst others. ZS-NAM started life on 3 May 1940 registered as NC27133 in the USA. In April 1946 the original engine was replaced with the Franklin 4AC-176-B2 65 Hp serial No 100687 and the propeller with a Sensenich W72F42 Serial No 40170. She was imported to South Africa in May 1991 and is now based at Jack Taylor Airfield, Krugersdorp (FAKR) where she is part of Alpi Aviation's fleet and used for training. What the Model T Ford did for motoring, the Piper J-3 Cub did for aviation. Almost 20,000 were built between 1937 and 1940. Although originally intended as a trainer it was the general aviation sector that ensured its success. The Cub's good low speed handling, short field performance, simplicity and affordability made it the ideal private aircraft. The same qualities that made the Cub a success in the private sector made her the ideal training, reconnaissance, liaison and ground control military aircraft. Large numbers were produced during WWII as the L-4 Grasshopper. The outbreak of hostilities in Europe in 1939 resulted in the formation in the USA of the Civilian Pilot Training Program (CPTP). The program trained civilian pilots who, in the event of the USA entering the war, could be enrolled in the Air Force. 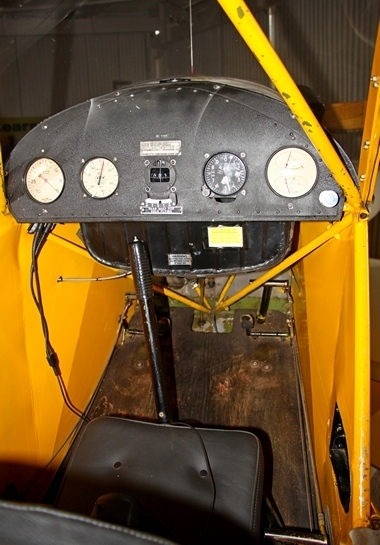 The Piper J-3 Cub was chosen as the program's primary trainer. By war's end 80% of all United States military pilots had received their initial flight training in Piper Cubs. Of the almost 20,000 Cubs produced the majority went to the Military. The need for new pilots created a huge demand the Cub. In 1940, a year before the United States' entered the war, 3,016 Cubs had been built. During the war demand increased to such an extent that a Cub left Piper's factory floor every 20 minutes. After the war surplus military Cubs were snapped up by eager private buyers. Bought in large numbers Cubs soon became a familiar sight all over the world and the best known light aircraft of all time. Dale has clocked over 100 hours in the Cub and he loves every minute of it. Alpi's fleet consist of the Cub for taildragger conversion, an Ibis Magic, Cessna 150 and 182.